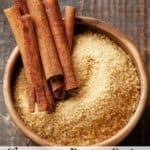 This cinnamon brown sugar body scrub uses olive oil to moisturize your skin as you exfoliate dry skin. Combine the brown sugar, olive oil, Vitamin E oil, and ground cinnamon in a bowl. Stir the ingredients until thoroughly combined. Store the sugar scrub a sealed container for up to 2 months. To use: Apply sugar scrub to wet skin. Massage the scrub into the skin and then rinse with water.